The global problem of waste packaging demands radical measures. A garbage slick the size of Germany called the Great Pacific Garbage Patch is drifting in the Pacific. Packaging manufacturers have concentrated on synthetic packaging over the last few decades, with plastic being used for almost 100% of net packaging. However, consumers want to buy organic produce in organic packaging and increasingly demand the ecological carbon footprint of natural packaging. Using packaging that is biodegradable not only limits the drain on fossil resources but also allows biodegradable substances to enter the supply chain. The Verpackungszentrum Graz has successfully made a step in this direction by developing tubular nets using compostable Modal cellulose fibres from thinning of home forests. 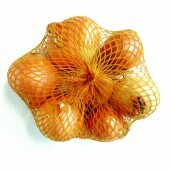 The nets first appeared on supermarket shelves at Rewe Austria in December 2012. 10 tonnes of plastic can be saved by Rewe alone, simply by changing the packaging for organic potatoes, onions and citrus fruit. 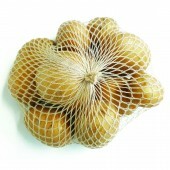 The breathable natural netting offers consumers the added benefit of keeping the produce fresh for an extra 2 to 3 days, and also prevents potatoes and onions from sprouting. The product feels soft and looks natural. The modal fibres are coloured during a special dying process, which only requires a small amount of dye. By composting the net, it becomes a source of nourishment for further food produce. 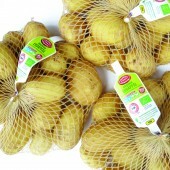 Produce that is no longer fit for sale can be disposed of together with ist packaging. The biodegradable net tubes are made using Modal cellulose fibres. Beechwood is used to produce the raw materials, which is a result of the thinning of forests in central Europe, using PEFC or FSC-certified forestry. Lenzing AG, world market leader for environmentally-friendly cellulose products, manufactures the Modal fibres in Austria using a CO2-neutral process, before they are spun into special threads by the Austrian company Borckenstein and finally turned into packaging nets. The Colors of Nature research project lead by the Institute of Textile Chemistry and Physics of the University of Innsbruck, includes research into dyes derived from plants or waste substances e.g. bark, skins or marc, and the definition of principles for their application in industry. Samples of packaging tubes were coloured on the laboratory scale using the following colours: yellow from goldenrod, beige from nutshells and orange from onion skins. The process is currently being scaled up. The natural life cycle raises many issues. In an ideal scenario, local refuse materials are used as raw materials, creating a value-added intermediary purpose, before they are composted or used for energy. The production of raw materials should not compete with the food production, thus avoiding the use of water and chemicals for agriculture. The fibre production should be as environmentally-friendly as possible with transport kept to a minimum, in order to reduce the burden on fossil resources. Verpackungszentrum Graz, Susanne Meininger e.U. The Austrian based trading company Verpackungszentrum Graz is a family enterprise which has specialised on biogenic packaging: Net tubes made from cellulose, net bags made from natural fibres, paper packaging, mechanical woodpulp, paper pulp packaging, fast food tableware made from cane sugar bagasse, wooden cutlery, cutlery made from cellulose, packaging made from starch or packaging made from PLA. Since more than 20 years Verpackungszentrum Graz has invested in research into new packaging alternatives. R&D Projects: 1. 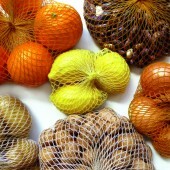 Bio net packaging made from cellulose in cooperation with textile engineers, 2. 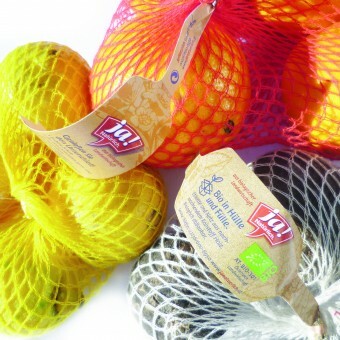 Plant dyed net packaging in cooperation with the Institute of Textile Chemistry of the University Innsbruck, 3. Alginsulate foams made from sea algae in cooperation with the Institute of Process Engineering of the University of Technology Graz, 4. Biopolymers made from agricultural waste materials in cooperation with the Institute of Biotechnology of the University of Technology Graz. Awards (selection): 2014 Fruit Logistica Innovation Award (Nomination), 2013 Materialica Design + Technology Award Best of CO2, 2013 Fast Forward Award, 2013 Fibre Plus, 2013 Energy Globe Award Styria, 2010 Austrian Climate Protection Award (Nomination), 2007 Creative Graz Award, 2006 Rio-Award, 2004 Trigos (CSR), 2001 Austrian State Prize for Exemplary Packaging (Nomination), 1997 Emballissimo / Printissimo, 1994 Ms Susanne Meininger Austria´s Top Young Manager of the Year. Cellulose Net Tube Compostable Packaging by Verpackungszentrum Graz is a Nominee in Sustainable Products, Projects and Green Design Category. · Click here to register today inorder to be able to view the profile and other works by Verpackungszentrum Graz when results are announced. Cellulose Net Tube Compostable Packaging by Verpackungszentrum Graz is Winner in Sustainable Products, Projects and Green Design Category, 2013 - 2014. · Read the interview with designer Verpackungszentrum Graz for design cellulose net tube here. · Press Members: Login or Register to request an exclusive interview with Verpackungszentrum Graz . 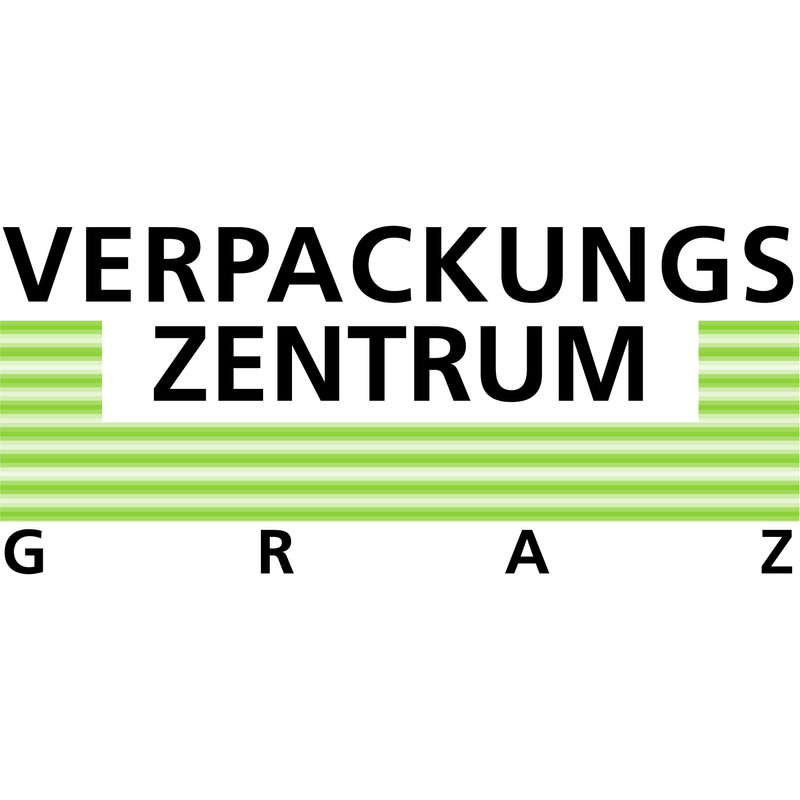 · Click here to register inorder to view the profile and other works by Verpackungszentrum Graz . Did you like Verpackungszentrum Graz's Sustainable Product Design? Did you like Cellulose Net Tube Compostable Packaging? Help us create a global awareness for good sustainable product design worldwide. Show your support for Verpackungszentrum Graz, the creator of great sustainable product design by gifting them a nomination ticket so that we could promote more of their great sustainable product designs.